Gratitude can bring joy to life in nearly every situation. 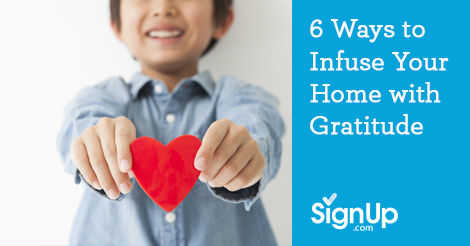 Here are some simple ways to incorporate gratitude into your family’s daily activities and routine. Dinner is a great time to share about the things we are thankful for each day. Go clockwise in a circle, youngest to oldest, or in no order at all. You may give everyone a target number (for example, "Tell us three things you are grateful for") or leave it open ended for people to share whatever they are grateful for. Decorate a jar and cut up pieces of paper to lay beside it, along with a few pens or pencils. Show everyone where the new Thankfulness Jar is (the kitchen counter is a great spot) and invite them to add things or experiences that they are grateful for into the jar throughout the week. At the end of the week, take the jar out and read all the items together as a family. Create a tree out of paper to tape on a wall or use sticks found outside to place in a vase, and cut a pile of leaves to hang or tape to the tree. On the leaves, write things you are thankful for. Thankfulness fills us up and reminds us how beautiful is, just like when we add leaves to the Gratitude Tree. Add leaves to your tree for a few days or a few months, it's up to you. Get a giant piece of paper and let everyone go to town drawing things they are grateful for. People, objects, trips or memories, anything goes. Let your child have the camera and take photos of all things they are grateful for. You may like to print out the pictures and then make a collage, or create a collage online (like in PicMonkey) and then print it for them. Most kids love the opportunity to use a camera! This is a unique way to get them to find things that they are grateful for, right around them. Simply get a notebook (or staple a few pieces of paper together) and write in things you are grateful for. Keep it in an easily accessible place and, of course, let little ones know they can draw pictures instead of write words! About the Author: Chelsea Lee Smith is an author, parent coach, and blogger at MomentsADay.com. She shares activities, resources and support for parents and children to grow into the best versions of themselves. She lives with her husband and three children in Australia.